A small, Belgian copper fish kettle. This piece is about the right size for cooking a small trout. It is marked, on the side of the pan, and also on the lid 'H. POMMIER BRUXELLES' and it date from c.1930. This is later than most of our copperware but it is a very useful, small size. 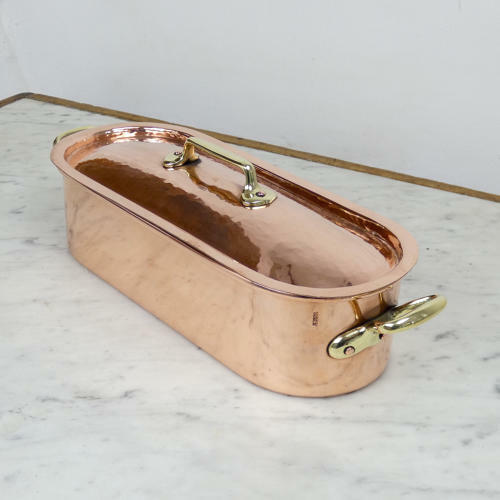 It is well made, from a heavy gauge of copper,and it has a plannished finish to the lid. The handles are cast from brass. It is in excellent condition and, although it has not been re-tinned, the tinning is still in good, usable condition.